Generally have obvious pain and deformity of the PIP joint. A/P and lateral of affected digit. True lateral xray should show a congruent joint surface with two parallel surfaces. “V” sign indicates incomplete reduction. 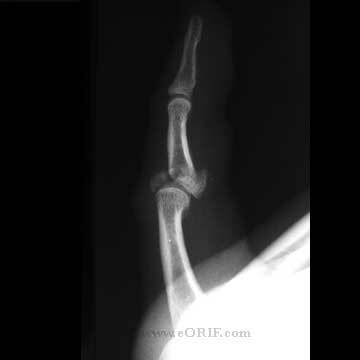 -Doral dislocation=volar plate is ruptured, usually at distal attachment on middle phalanx. May be clinically inconsequential avulsion fragment. RX: dorsal block splint at 20-30 degrees for 1 weeks followed by AROM with buddy taping. -Volar dislocation= rare; rotatory compression on semi-flexion middle phalanx; usually unilateral collateral ligament disruption and partial volar plate avulsion, completely volar may rupture central slip of extensor mechanism. Test ability to maintain full extension after reduction. If stable begin mobilization. If unstable consider immobilization of the PIP in extension or with surgical repair of the central slip. Central slip insufficiency leads to formation of a boutonniere deformity. -After reduction, these injuries are frequently immobilized for too long of a time period and in too much flexion. As a result, the ruptured volar plate contracts, scars, and shortens as it heals. After the injury, it is important to mobilize the joint as soon as the patient is comfortable. 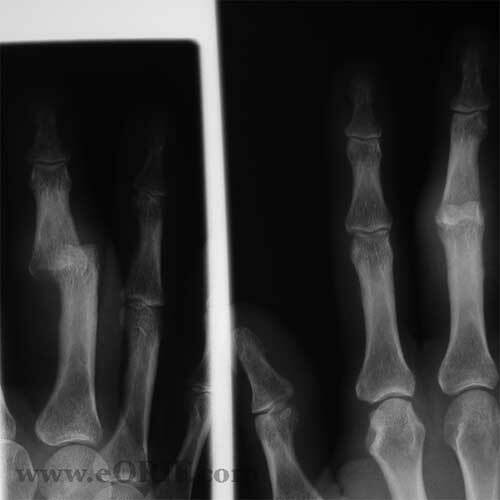 The patient will sometimes require intensive physical therapy to get the proximal interphalangeal joint extended again. Redislocation or subluxation, arthritis, and collateral ligament instability are much less common. 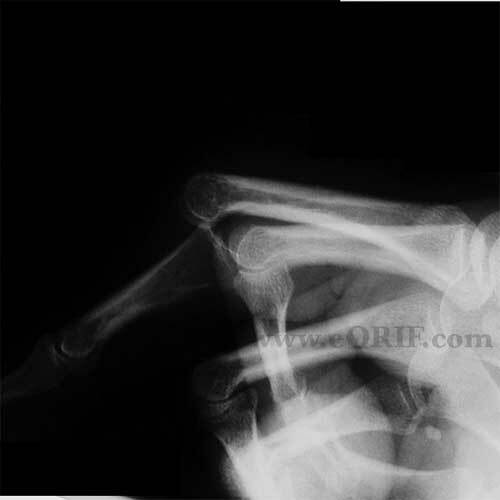 -Displaced=ORIF to avoid boutonneire deformity. Dorsal approach, mini-screw vs tension band vs k-wires. -<30% articular surface fracture is typically stable after reduction. Treatment = short period of immobilization followed by buddy taping with ROM exercises. ->50% of articular surface fracture is unstable. Treatment = ORIF vs CRPP/extension block pinning. ->60% articular cartilage comminuted and impacted: hemi-hamate arthroplasty with bone graft indicated. 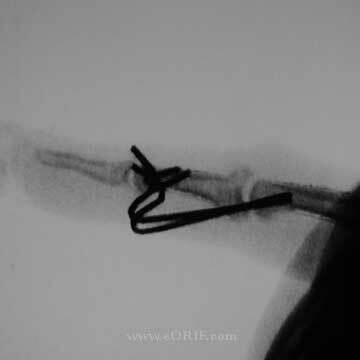 6 Weeks: Remove k-wires, wean from splint use as soon as callus is visible on xray. Continue activity modifications. Agressive ROM.